Wine School – Week 2! – It's Wine By Me! Wine School – Week 2! Last night’s class was all about varietals: Cabernet Sauvignon, Chardonnay, Sauvignon Blanc and Merlot. But it’s impossible to talk about those grapes without lessons in winemaking, climate and geography. It served as a wonderful reminder of how well-rounded studying wine can be. There’s less sulfer in a bottle of wine, than in trail mix. The sulfer dioxide that many people are afraid of helps keeps grapes oxidized, it fights mildew in the vineyards and fights against yeast and bacteria in the wine. Even though Burgundy is usually associated with Pinot Norir, more than 60 percent of the region is planted with Chardonnay. The hotter the season, the more rapidly acid falls. Wines from cooler climates have higher acidity levels than those from warm and hot climates. A lot of Chardonnay now grows in China and North India, too. Irrigation is not (or very rarely) allowed in Burgundy, unless you obtain special permission, which is hard to do. 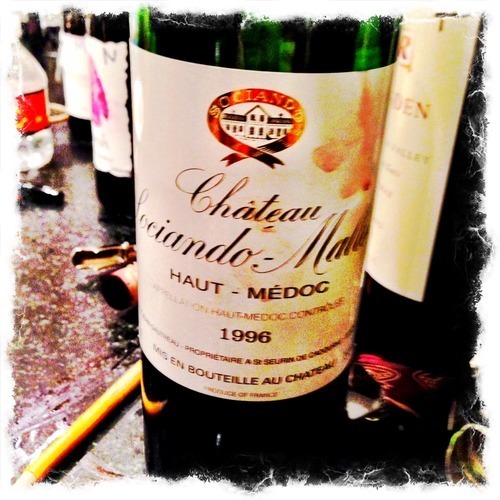 A fair guestimate that about 95 percent of all wines don’t get better with bottle age. New Zealand now makes more Sauvignon Blanc than France. Our instructor highly recommends trying a White Bordeaux from the Pessac Leognan winegrowing area of Graves. 2012 was a fabulous year for Oregon Pinot Noir. Probably the most important take away from this class – not related to the formal lesson plan – is that it confirmed my general dislike of many Cabernet Sauvignon and Bordeaux (red) wines (we tasted both a Bordeaux and a California in class). Even when blended with other grapes. Sadly for now, those green bell pepper flavors don’t agree with my palate. I’m not going to give up on them, and with food pairings and age, maybe I’ll eventually grow to like them. As for that empty Bordeaux bottle I posted at the top of this page, I did enjoy the wine, but I didn’t ask for a second glass. Instead, I reached for some Burgundy.